As of August 28th, there were 121 active wildfires listed in British Columbia—principally in the Cariboo region of B.C.’s Central Interior. The B.C. Wildfire Service now pegs the total area of the province burned by wildfire in 2017 at an incredible 1,022,325 hectares! This means that the area burned is now 4,325 hectares larger than the 1,018,000 hectares that comprises the entire Haida Gwaii archipelago on the North Coast of British Columbia! 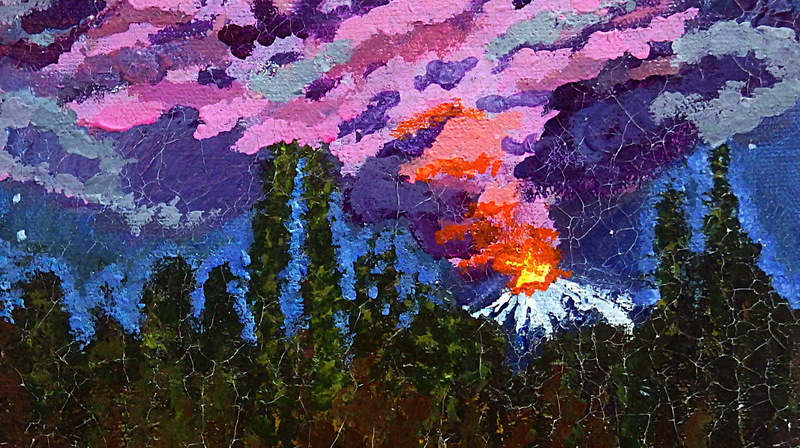 This will be a wildfire painting when and if the lava reaches the trees. Sunday evening (August 27) a homeless friend left a fiery little painting on my trailer that was clearly the result of someone’s runaway imagination. 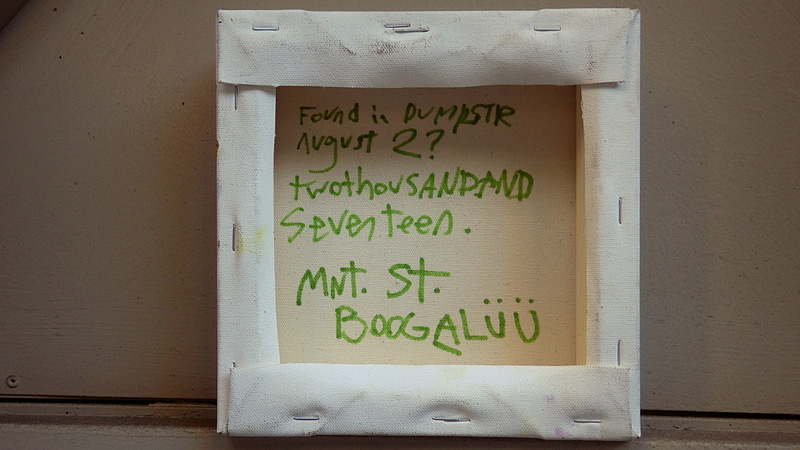 A helpful note in green marker on the back of the stretched canvas gave the bare particulars that it had been found some time around August the 2nd in a dumpster, somewhere within my friend’s ambit of Fairview and Kitsilano. Provenance is so important when dealing with fine art. 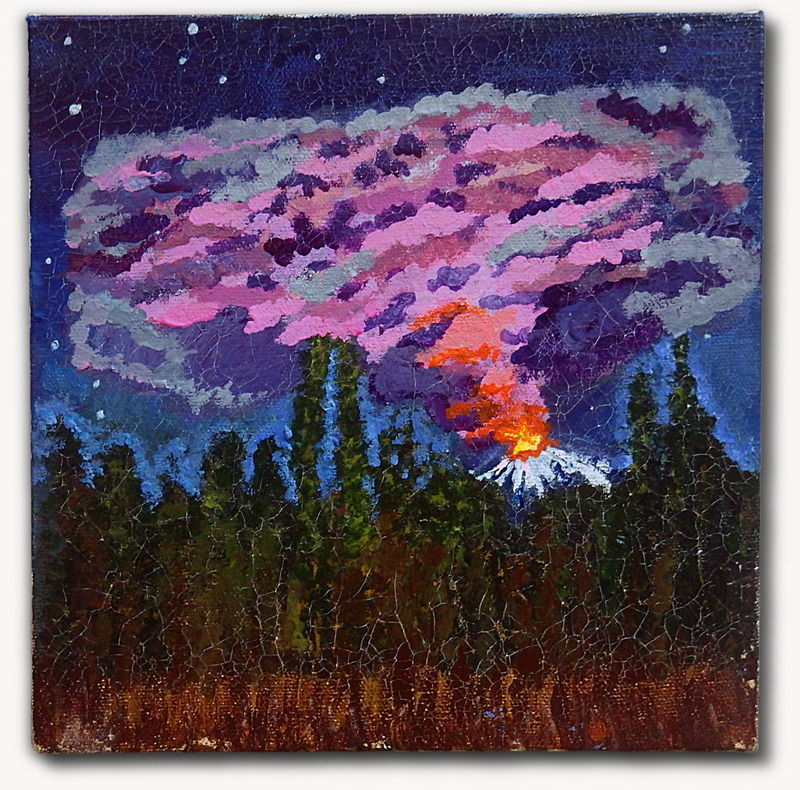 Unlike a previous abandoned painting that I laboured to link to B.C.’s wildfires—even though it only showed conifer trees against a red sky suggestive of flames—this latest painting has conifer trees and flames and smoke as well. At first glance on Sunday night I actually took it to be a wildfire scene. But in the light of day on Monday morning I could not mistake the fact that the fire and smoke was actually belching out of an erupting volcano, located some ways behind the trees. A volcano! Talk about gilding the lily! I understand artistic license but you would think that the wildfires of B.C.’s Central Interior are a dramatic enough subject by themselves, without adding vulcanism! Of course, we’re lucky here in Vancouver if the only wildfires we ever see are conflagrations of paint on canvas left in back alley dumpsters; with the only thing to get out of control being the brushwork and the artist’s imagination. Click the images to enlarge them. As a resident of BC for 20 years, the fires this year were one of the worst and it was heart breaking to watch those that lost their homes and their memorable items. I hope that the province can recover together. Agreed. Statistically, this was the worst-ever fire season in British Columbia history by an enormous margin but that doesn’t begin to convey the effect on peoples’ lives. I can only compare it to a war zone. So much loss of security and safety. Hopefully the Cariboo region is spared anything like a repeat in 2018, so that it can rebuild and heal.